Belgium’s round-of-16 win over Japan was a shocker, with the Red Devils coming back from an 0-2 second-half hole to win 3-2 on a thrilling counter at the very end of stoppage time. It’s gotta be difficult to swallow for Japan, because that final counter—an absolute thing of beauty—came off a poorly plotted corner kick, in which not nearly enough Japanese players got back, or even though to get back. If only there was someone who could have seen it coming. There was, but unfortunately, he was delicious. 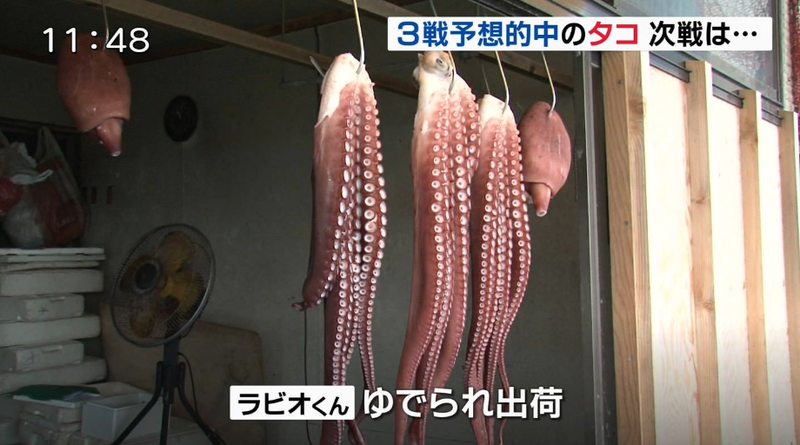 An octopus, brilliant but doomed, was caught off Obira, a town in Hokkaido, the day before Japan’s World Cup opener against Colombia. The 51-year-old fisherman, Kimio Abe, dubbed him Rabio, and immediately put him to work. Abe sectioned off a kiddie pool with the flags of the teams, plus a third area representing a draw, and Rabio predicted the winner of the match by taking refuse in the “Japan” slice. Japan went on to upset Colombia. Rabio wasn’t done, and he also wasn’t a homer. He predicted—correctly—that Japan would draw with Senegal, and then that Japan would lose to Poland. He was three-for-three. “I’m glad that all the forecasts turned out correct and Japan moved on to the knockout stage,” Abe told the Mainichi Shimbun. However, Rabio has since been sent to the market so Abe will use another octopus to predict the result of Japan’s game against Belgium. [Abe] promptly had Rabiot “shipped,” which is a polite term for having the octopus gutted and cleaned before sending him off to market. This is indeed a little bit depressing, not because octopuses are highly intelligent and emotional creatures, but because there is so much money to be made if you finally find the psychic World Cup animal who doesn’t choke in the clutch. But Abe was not sentimental. Yes, there was a Rabio II. I am unable to find out who he picked in Monday’s match, but it doesn’t matter any more; there are no more Japan games left to predict. Romelu Lukaku may be a genius, but the Curse of Rabio was the true man of the match.